Elevation profile created by Zdenek on his 2014 GDT hike Thank you for allowing me to share these Zdenek! I had stayed up past midnight doing town and blog stuff, so I luxuriously slept in til 7:30am this morning. We left the house at 11am so we could run a couple errands and then make the noon shuttle we had booked back up to Sunshine Ski Resort. 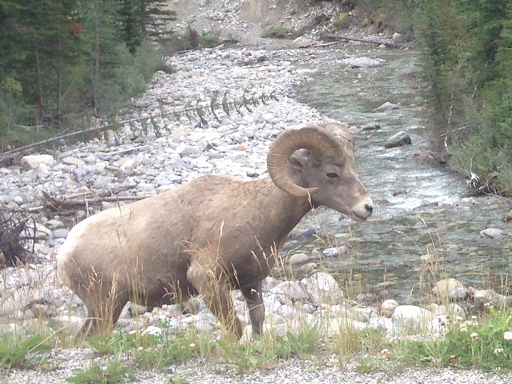 On the drive up, we saw some bighorn sheep right by the road. I got a good shot of one of them. Man, they are impressive! By the way, I am stoked to have a camera again! I had tried the Panasonic LUMIX DMC-ZS35 and was NOT happy with it. It stopped working a couple weeks ago and now I went back to the earlier version, DMC-ZS25, and am happy once again. It just takes much clearer photos and that’s what I happily used on the CDT and AT. 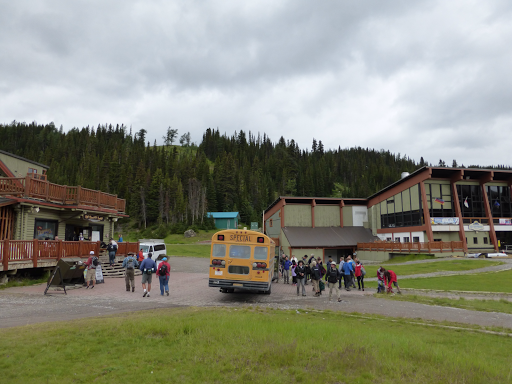 Back to today, it’s a 3mi/5km hike up a steep road to get back to the resort and cars can’t drive that stretch, so we gladly paid the $27 round trip to do the shuttle. We still had a short bit to do on a side trail to connect to the GDT, but it was insignificant. I remembered to get a photo of the resort area this time. 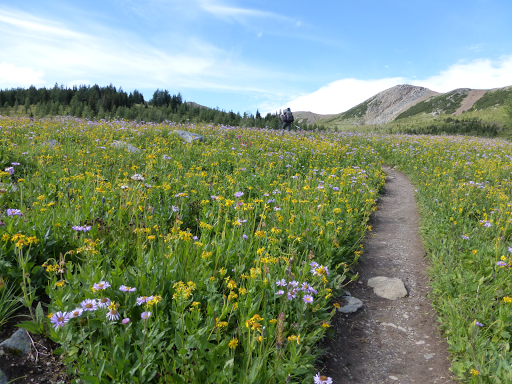 It is a popular destination for many short day hikes in the summer for lakes, views, and wildflowers. The bus we took was full. The forecast for the next three days is rain. As soon as we got dropped off, it started raining. We only had about four hours of hiking to do, so we decided to go in the lodge and see if the fog and rain would lift. Good thing we did because the light rain became a horizontal hard rain and even snow mixed in at times. Visibility was very low. Yep, this is common in the summer here. 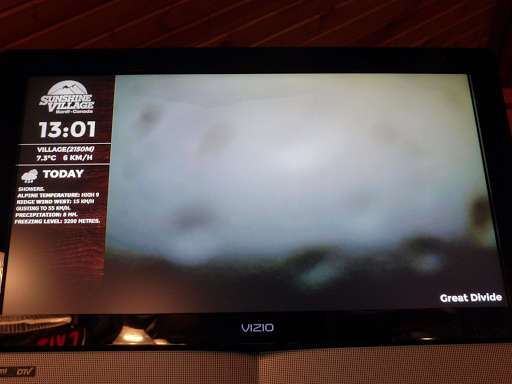 The TV screens in the lodge had weather camera shots for various spots around the resort. One was the Great Divide. Here’s how it looked. Notice the temperature of 7.3C/45F. Yep, chilly. We ended up relaxing there with wifi and food(I couldn’t resist chicken fingers and fries) for over two hours. We were glad we only had a short hike in to get to our reserved campsite. 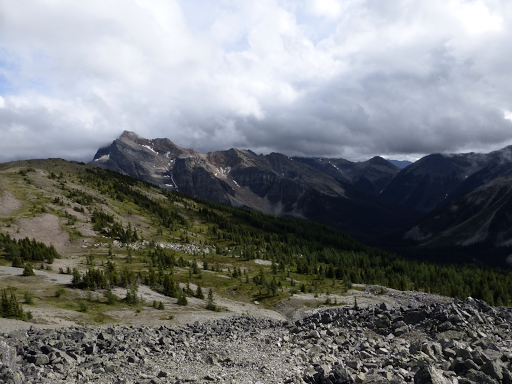 All three of our campsites this leg are reserved ones for Banff National Park that E booked two months ago. 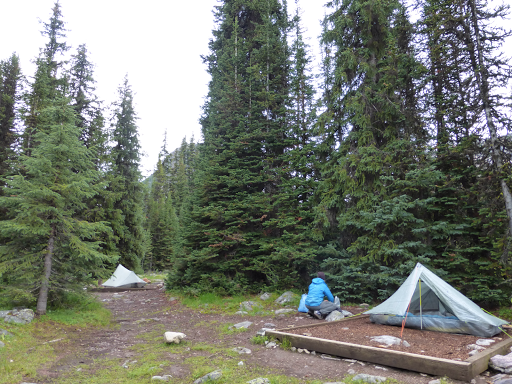 The campsites make it difficult because you’re trying to balance mileage of a leg with site availability. With what we have, we have a short day out, two solid days in the middle, and a long final day. While in Banff, we tried to get a bigger day today to shift sites and shorten the last day , but the site we needed to make that happen was expectedly still booked solid. As fate would have it, that worked in our favor. We were able to wait out the cold windy rain and headed out to sunny trail and some blue skies! We started out in rain gear exoecting it to be short lived and ended up taking it off not long into the hiking. Man, our timing has been great this hike! 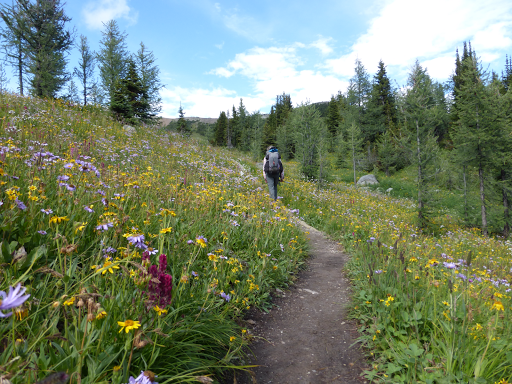 It was a nice relaxing hike in with wildflowers galore. They went on as far as the eye could see. We had one high pass called Healy Pass and it wasn’t bad at all. A nice gradual climb. 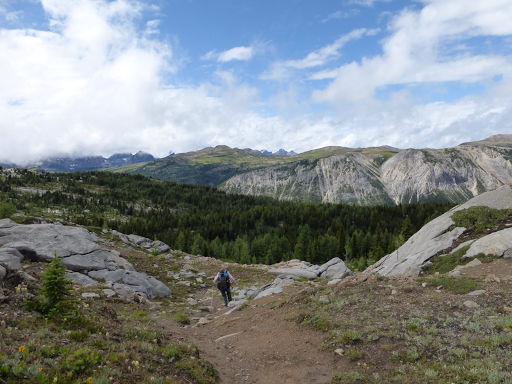 We did a short side trip that was recommended from the pass along a ridge towards Monarch. It led to what is called the Monarch Ramparts, which we were trying to figure out if that was the mountains or the cliffs over there. I think we expected it to be more obvious, but it was nice. 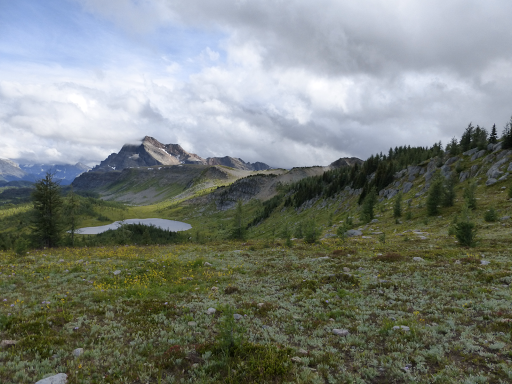 From Healy Pass, it was a downhill cruise to Egypt Lake Campground. We could see the lake as we came down the pass and it was really cool to see. It’s the lower one at the base of the impressive mountain. 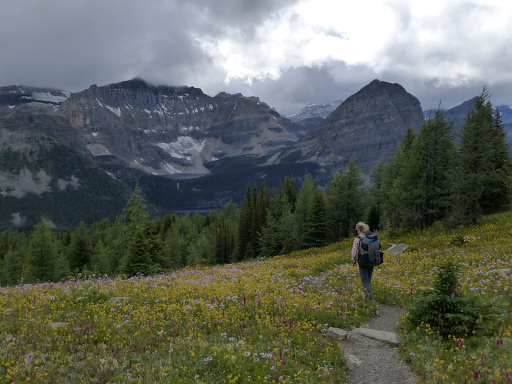 We just couldn’t get over the combo of the wildflowers, mountains, and clouds. We arrived at 6:30pm happily dry! There are 15 tent pads and we were able to get two next to each other. The lake is still a ten minute walk away, but and easy side trip along the route tomorrow. E just went there to walk off dinner. We’re happy to be in a protected spot with little wind in case it rains overnight. We expect to walk through some amount of rain tomorrow. 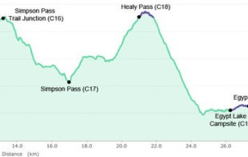 Tomorrow is a 21mi/34km day that includes a big descent and climb of 3000ft/1000m each way. It’s possibly the most strenuous of all the climbs thus far. Combined with a possibility of rain could make for a long day. We have been sooo lucky with dodging rain while other hikers around us are getting hammered with downpours and whiteouts. Their experience is more the norm and we are definitely the anomaly. It may be our turn to get hit the next two days, but fingers crossed that whatever groove we’re in to avoid the rain continues! Since we have reserved campsites this leg and it’s clear trial in a national park, we are going to take the opportunity to hike solo and do our own routines the next two days. 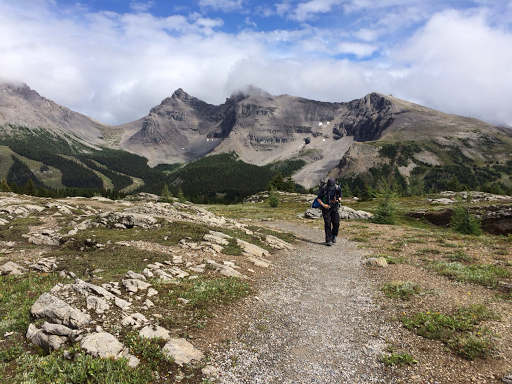 We both are accustomed to solo hiking and it will be fun to do that and get some of that solo time in a bit this leg. It will get more remote and better to stick close together as we head north, so we’re doing some solo stuff while we can. I get to watch some of OITNB before I go to sleep tonight!